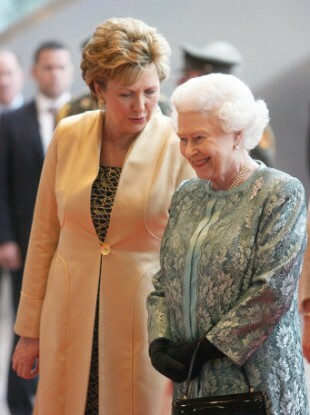 President Mary McAleese speaking to Queen Elizabeth II during her state visit to Ireland in May. THE TWO STATE visits hosted by Ireland earlier this year cost the state almost double what had been expected, it emerged today. Speaking in the Dáil today, Minister Alan Shatter confirmed that the visits by Britain’s Queen Elizabeth and US President Barack Obama cost Ireland €36 million. The figure had already been suggested by PJ Stone, the general secretary of the Garda Representative Association, although the government had indicated earlier that the visits had cost the state less. Taoiseach Enda Kenny had indicated in June that the state would pay out around €20 million for the two visits, while Shatter had said in May that the Defence Forces’ bill for the events was estimated to hit €1.73 million. Shatter’s estimate did not include garda security work and overtime payments. Today, Shatter said that the cost of the garda operations was €15 million and that “efficiencies” by the gardaí meant that this was covered by the service’s allocated supplementary expenses. Fianna Fáil TD Dara Calleary raised concerns that some garda operations would be curtailed as part of those “efficencies” in order to cover the cost of the state visits, and questioned where the other €21 million for the state visits would come from. Email “Shatter confirms the royal and US state visits cost Ireland €36 million”. Feedback on “Shatter confirms the royal and US state visits cost Ireland €36 million”.